The receptionist was amazing... he made sure our accomodations were clean and comfortable. 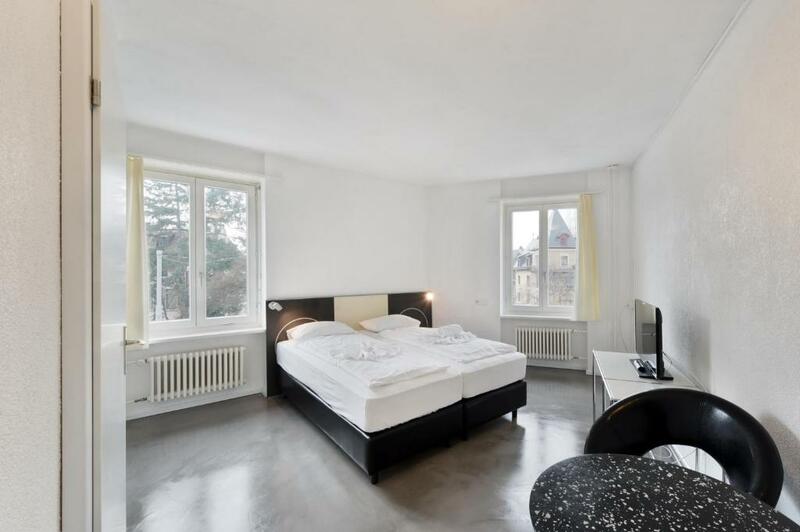 The place was very nice, we came to Zürich in 3 am at the morning and the guy woke up just for helping us! That’s was really sweet. The room was clean, the location was good (5 minutes from public transportation) There is a supermarket very close to the room. The price was very good also! Very recommended! Everything was great. Good service, very clean and comfortable place, thanks! The property was very good ...with jacuzi in bathrooms the first impression was very good ..a nice to update room.lift is not there still way to room wasmanageable. Room was very spacious with a full kitchenette and flat screen tv with various channels. There is an excellent restaurant downstairs with great prices and gourmet food. The proximity to a major tram station was icing on the cake. I recommend California House! Automation. An ATM-like greeted us at the front door in the middle of the night. Entered code and keys were there instantly. ONly downside was parking...or lack of it. We did not bring Swiss currency but the lady at the front desk was so nice that invited us a coffee. Great location, in residential area so nice and quiet, but only 30 mins walk to main train station. Jacuzzi bath was great! Very kind accommodating hosts , and close to the Lake. spacious, room with excellent bathroom facilities and adequate kitchen unit to heat up some meals; very good location for exploring the town. California House This rating is a reflection of how the property compares to the industry standard when it comes to price, facilities and services available. It's based on a self-evaluation by the property. Use this rating to help choose your stay! One of our best sellers in Zurich! 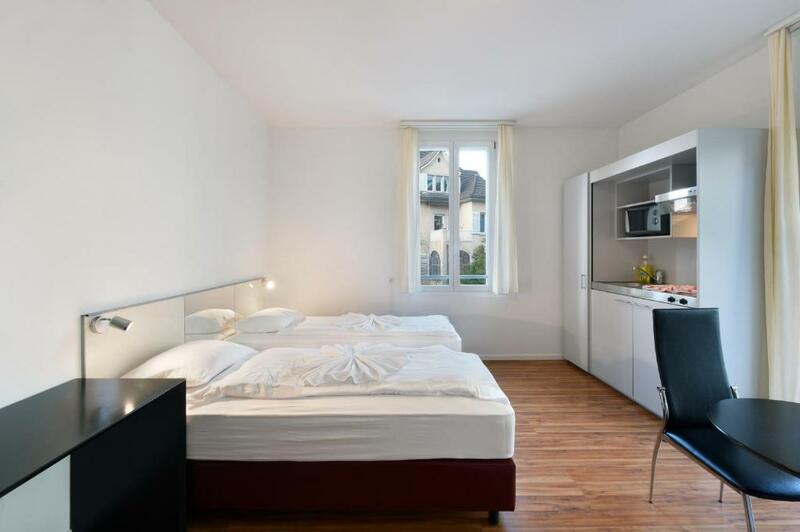 Just a 12-minute tram ride from the center of Zürich, Lake Zürich and the Bahnhofstrasse shopping street, California House is located in a residential area and offers studios with kitchenette, free WiFi and wired internet access and a flat-screen TV with satellite channels. Some rooms have a balcony. 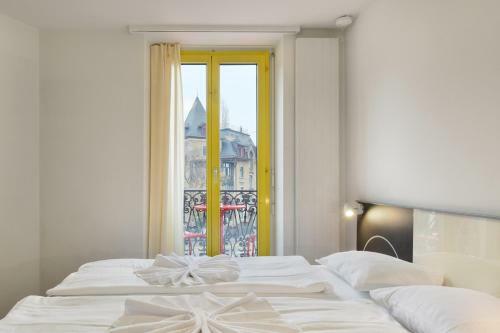 A weekly cleaning service plus linen and towel change are included in the rates. An Italian restaurant is located on the ground floor of the building. When would you like to stay at California House? Spacious studio with a kitchenette and a spa bath or a balcony. 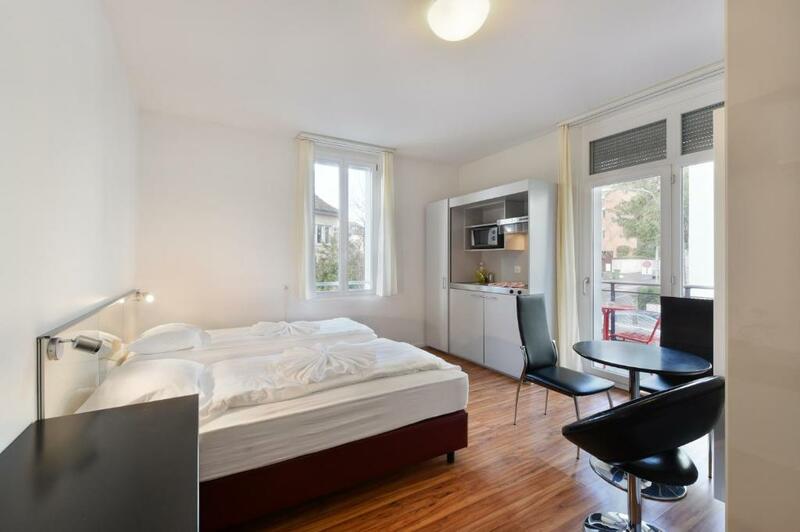 En-suite studio with a kitchenette and a flat-screen TV with satellite channels. The elegant, modern studio includes free Internet access via cable and WiFi and consist of a flat-screen TV with satellite channels. 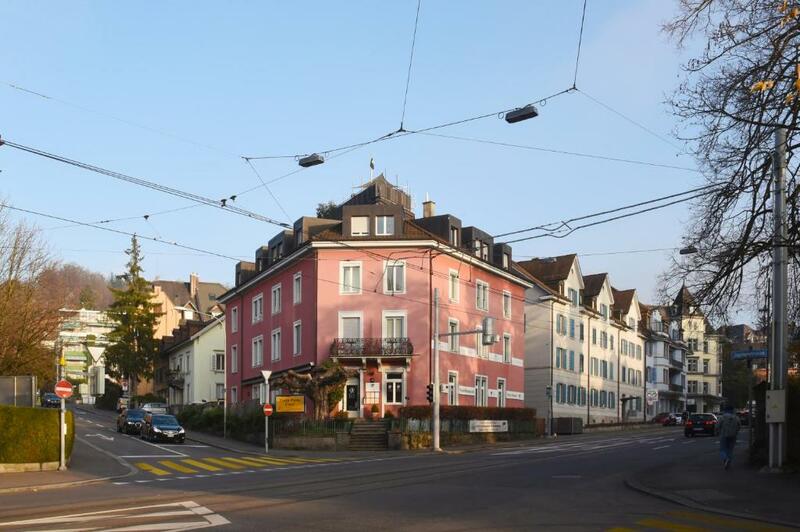 Unser familiengeführtes Apartmenthaus California House liegt beim zentral gelegenen Klusplatz, am Fusse des schönen Zürichbergs. Alle Zimmer sind mit einer Küche, einem eigenen Badezimmer (WC und Dusche/Badewanne) ausgestattet. Internet steht kostenfrei zur Verfügung. Ein Flachbild-Sat-TV ist ebenfalls vorhanden und hat eine grosse Auswahl an internationalen Sendern. Alle Zimmer sind mit Boxspring-Betten ausgestattet (Einzelbetten die sich mühelos in ein grosses bequemes Doppelbett umwandeln lassen können, Die Rezeption befindet sich im Restaurant des Hauses, Ristorante Pizzeria Bar Lounge Belladonna. Die Öffnungszeiten der Rezeption, richten sich nach den Öffnungszeiten des Restaurants: Mo - Fr von 12:00 bis 14:00 Uhr und von 18:00 bis 23:00 Uhr / Sa von 18:00 bis 23:00 Uhr, Sonntags geschlossen. Den Schlüssel erhalten Sie über den Self-Check-In-Automaten, der beim Hintereingang des Hauses ist. Er ist sehr einfach zu bedienen. Sie brauchen nur Ihren Nachnamen oder Ihre Buchungsnummer einzutippen und der Schlüssel für Ihr Apartment kommt raus. House Rules California House takes special requests – add in the next step! California House accepts these cards and reserves the right to temporarily hold an amount prior to arrival. Please note that the reception is located in the Italian restaurant and outside the regular opening hours, there is a 24-hour check-in machine. The dinner consists of a small salad, one dish pasta or pizza, a drink and a coffee. Please note that from 16 July to 23 July 2018 the restaurant will be closed. The rooms were very clean.. There were some noisy late night guests. Very kind staff. They responded quickly to all my needs. I recommend the place to everyone. Easy acces total public transport. Clean, confortabile room. The bed was not the most comfortable - one side needed to be replaced, but thankfully the other side was fine. It's not very cosy and the tram line outside is quite loud (depends on your room I suspect). A little bit of decoration would go a long way to making this a more welcoming room. California House has very useful transport links into town and pleasant surroundings. The bakery up the road is particularly nice. The staff were very nice and the room was clean and spacious. Check in and out were very easy. It was practical, if a bit spartan. Everything, perfect place to stay especially as this was a last minute trip and didnt have much time to figure out what was where in zurich. Easily accessible to the tram links into town which take no time and loads to see around the local area too. Coop outside the tram station a minute or two walk from the hotel which was ideal especially as we had a little kitchenette. Fantastic room, really friendly staff, would definitely recommend and stay again. It is possible to check-in by machine, what is super easy. View on the city from third floor is very nice.